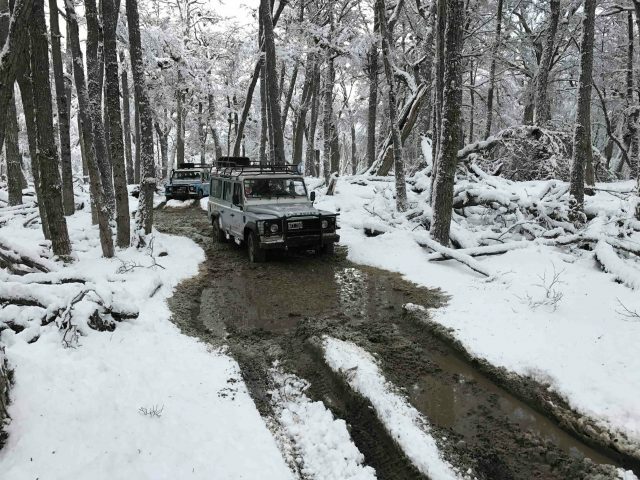 Tierra del Fuego. The very name conjures up images of great 16th-century explorers, precariously navigating their tall ships through the iceberg-filled archipelago. 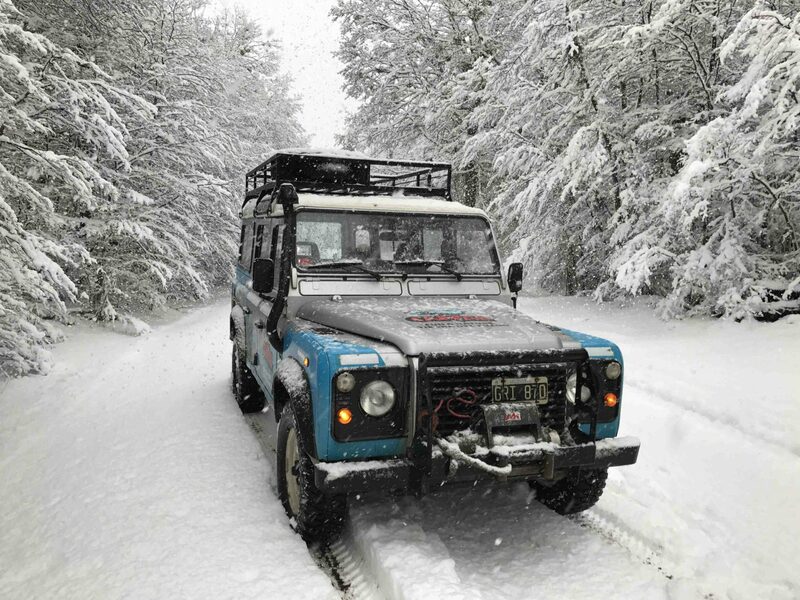 These days, the exploration vehicle of choice is a 4×4, as apart from National Route 3, you will find no paved roads here. 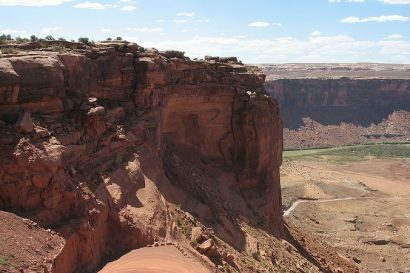 It’s wild, rugged, and remote. Just how the end of the world should be. Over the course of 3 days, we set out to explore the lakes region on the Argentinian side of the main island of Tierra del Fuego. 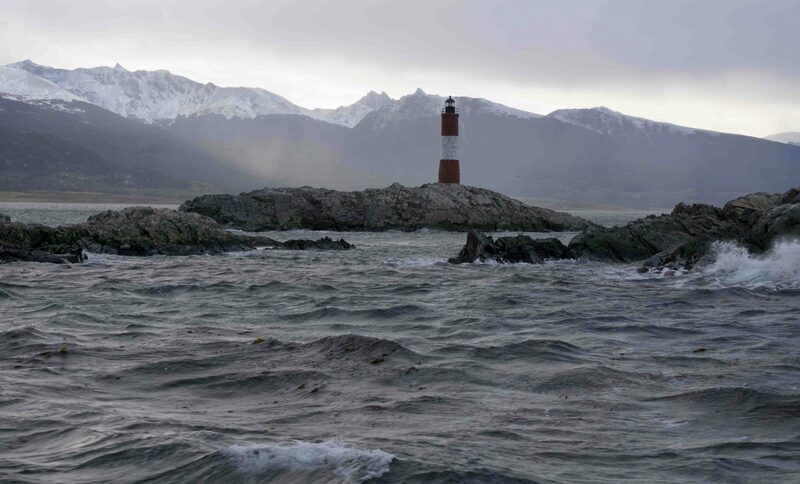 The island is separated from the mainland by the Strait of Magellan and forms a triangle, with the Atlantic Ocean and Beagle Channel serving as its other sides. This is the very tip of the South American continent, where the Patagonian steppe runs smack dab into the Andes—arid plains on one side, thick lenga forests the other. Breaking away from their usual north to south orientation, the Andes run east to west down here, at one time connecting the continent with Antarctica. 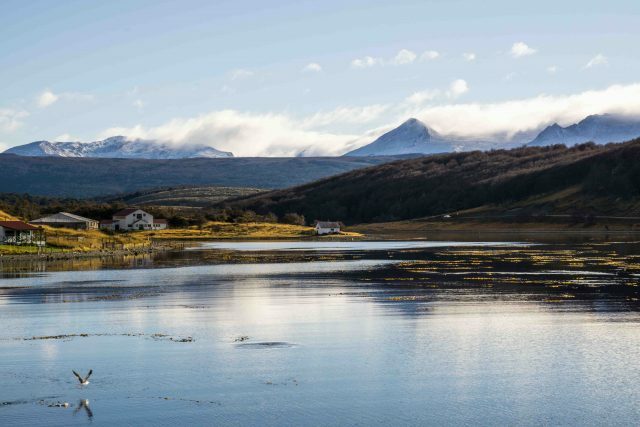 We arrived in the lakes region via ferry, leaving the corrugated metal and brightly painted wood houses of Ushuaia behind to navigate the Beagle Channel eastward toward Harberton. Sea lions, dolphins, cormorants, albatross, and even humpback whales kept us company as we sailed past the Les Eclaireurs lighthouse and Gable Island, stopping to view Magellanic penguins at Isla Yécapasela before disembarking at Estancia Harberton—the historic home of the Bridges family, one of the first European settlers in the area. As our boat pulled up to the dock, the sun slowly set behind the mountains, casting a golden glow over the surrounding grasslands—a sharp contrast to the inky calm waters of the bay. I couldn’t help but wonder if this is how Thomas and Mary Bridges felt when they arrived here for the first time over 100 years ago, arguably after a much longer and more perilous voyage. 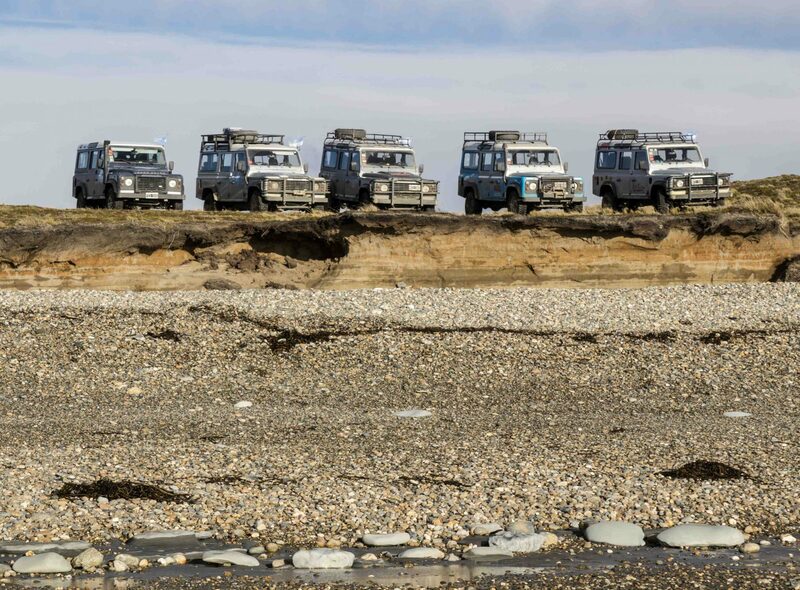 Five tricked out Landrover Defenders awaited our arrival, ready to whisk us away to our homebase for the next few days: Hosteria Kaiken. 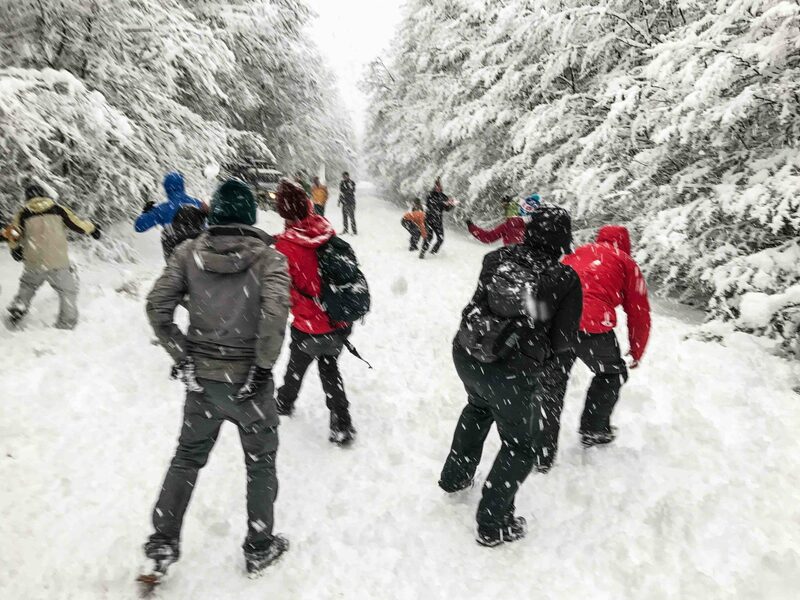 Set on the shores of Lago Fagnano, this cozy boutique hotel, where Juan and the rest of the staff go out of their way to make you feel at home, serves as a launchpad for a variety of outdoor activities, from birdwatching and trout fishing in the summer to skiing and dog sledding in winter. At this time of year, the sun doesn’t rise until well after 9:00 am. Couple that with not a single clock able to tell the correct time (possibly due to frequent power outages) and it can be a bit disorienting to say the least. 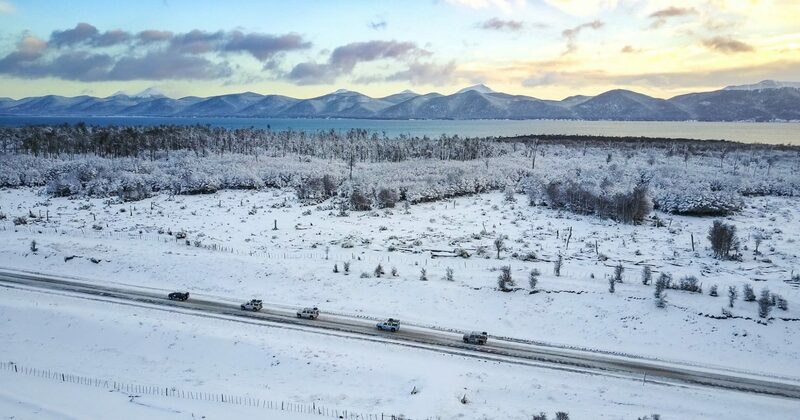 Despite the frigid darkness, we awoke early the next morning to head towards the far eastern side of the island and the shores of the South Atlantic Ocean. Our route took us through the tiny hamlet of Tolhuin. While no bigger than a two guanaco town, it’s home to the famous Panaderia La Union. Established in 1984 by Emilio Saez and his wife Cora, the bakery provides a welcome rest stop for people traveling the Pan American Highway between Rio Grande and Ushuaia. Anybody who’s anybody in Latin America has patronised this bakery—if they are famous enough you will see their photo lining the walls, scattered amongst pictures of award-winning trout caught in the surrounding rivers and lakes. Bearing a strong resemblance to James Gandolfini, Emilio still mans the counter today, working his charm on all who enter. Armed with coffee and fresh-baked goods, we jumped back in the Landrovers and headed off road toward the coast. Like pirates, we were in search of shipwrecks and this time one in particular, the Desdemona. 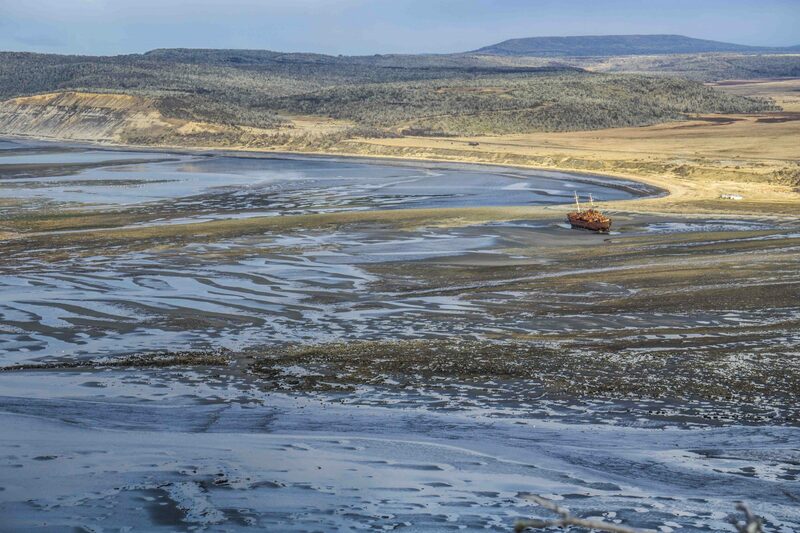 Slowly rusting away atop her sandy grave, the Desdemona met her fate one stormy winter morning in 1983, running aground on the beach of Cabo San Pablo between the mouths of the Ladrillero and San Pablo rivers. Whether it was wind and waves that caused her demise or a purposeful act in hopes of a lucrative insurance payout, the cement bag cargo still lines her hull, forever anchoring the ship in place. 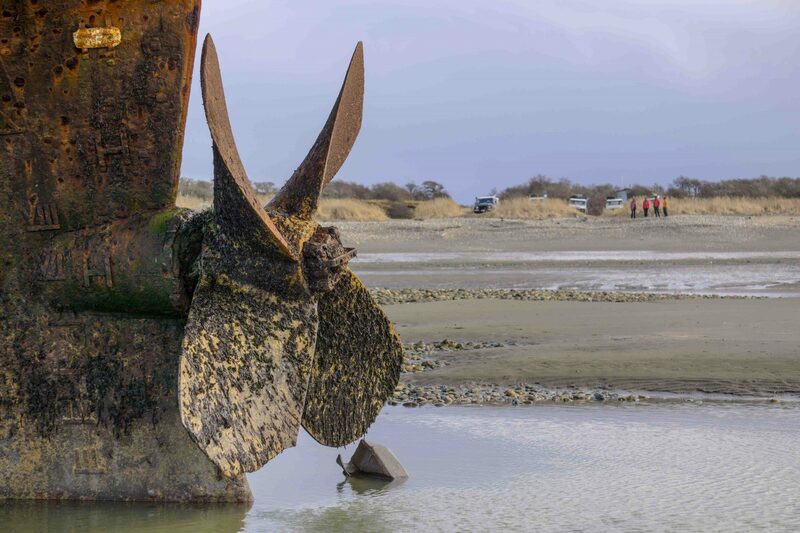 A steep and somewhat muddy climb to the top of the hill on the cape itself delivers a birdseye view of the shipwreck, the coastline, and surrounding terrain; it is well worth the effort. We enjoyed some hot mate to steel us against the now-falling rain while exploring the old lighthouse ruins and guessing to which animal the scattered bleach-white bones belonged. With no predators on the island, the guanaco or sheep bones were most likely picked clean by the large condors circling overhead. Weary from a day of driving and exploration, our spirits lifted as we came upon a brewery located in the middle of nowhere near Tolhuin. 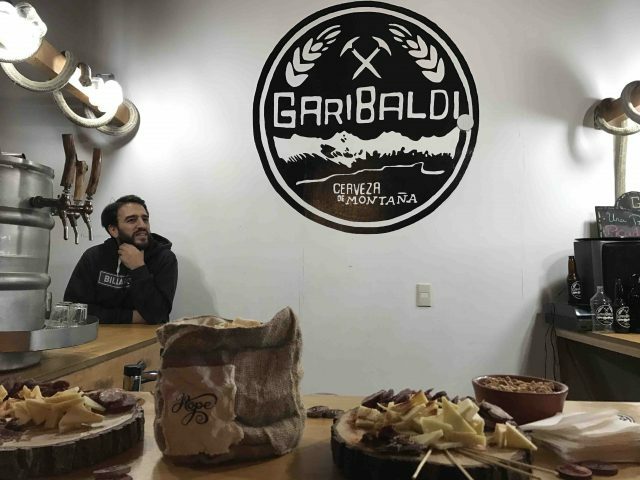 Arguably the southernmost microbrewery in the world, Garibaldi currently serves up three kinds of what they call cerveza de montaña in their tap room: golden ale, stout, and scotch ale. A small tour of the garage-based, homebrew-sized operations revealed the team is currently working to perfect their IPA—look out, Oregon. After a couple of sample pints served alongside snacks of locally made sheep cheese, lamb salami, and raw lamb ham, we left rejuvenated, despite the gale-force winds and snow beginning to fall outside. The next morning greeted us with over 53 centimeters or almost 2 feet of new snow—a freak early season snowstorm with weeks still to go before the start of winter. Driving in these conditions can be treacherous for most down here. While not a problem with our studded tires, we did pass a truck overturned on the side of the road, its cargo of brand new mattresses strewn about everywhere. To give you an idea of the intensity of the weather down here, each time our driver Maxi tried to spray the windshield with wiper fluid, the liquid was instantly swept away by the wind, barely hitting one side of the glass, if at all. The day’s adventure took us to a 4-kilometer dedicated off-road track winding its way through the woods on the shores of Lake Fagnano. Normally averse to motorized adventures, even I couldn’t escape the pure adolescent joy of plowing our way through untouched snow. All around us, the snow stuck to the lichen-covered trees like frosting—it was a winter wonderland. After a couple of tries at full speed to get up a steep hill, we made a sharp turn onto a narrow track. Because of the recent stormy weather, we had to navigate potholes filled with muddy water that reached the top of the wheel well and downed trees blocking our route. At each tree, we would all jump out of the cars to assess whether we could hoist them out of the way ourselves or if we needed the assistance of the winch. We loved using the winch. 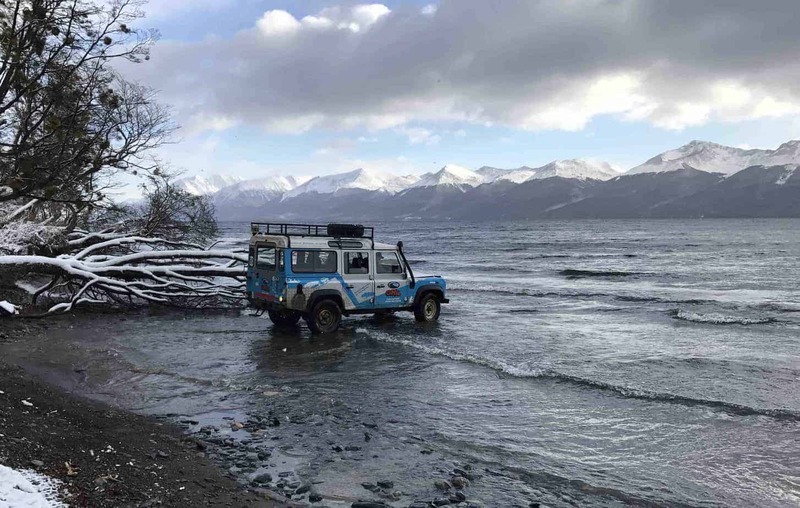 At one of the longer, deep potholes, one of our drivers, Juan, decided to show us what a Defender could do. 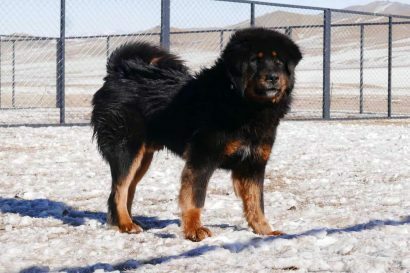 He put the beast into first gear, then promptly jumped out of the vehicle. We all sat stunned in the back seat as the car drove itself to the other side where Juan jumped back inside, a huge grin across his face. 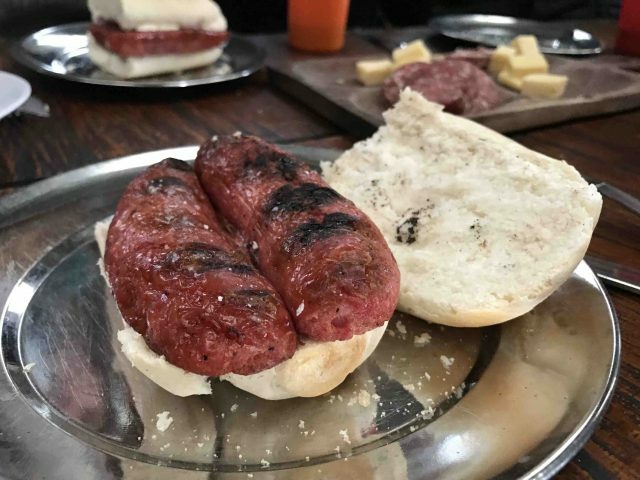 We broke for lunch at a small cabin, hidden deep in the woods alongside the lake— choripán and steak cooking on the grill outside with empanadas warming atop the wood- burning stove inside. As the token salad bowl sat untouched in the corner with our coats, we made quick work of the meat and the wine. There was always wine. A little fuzzy on our hike back out to the vehicles, my reflexes were sluggish as a large snowball whizzed right past my head. “Snowball fight!” someone yelled from behind me. With white missiles instantly flying from every direction, I dove for cover behind one of the Defenders. Little did I know two people were hiding in the trees behind me. I stood no chance and was quickly buried up to my head in snow. Rolling back into Hosteria Kaikén wet and cold, the sight of fresh lamb roasting for hours over a fragrant lenga-wood fire instantly warmed our bones. 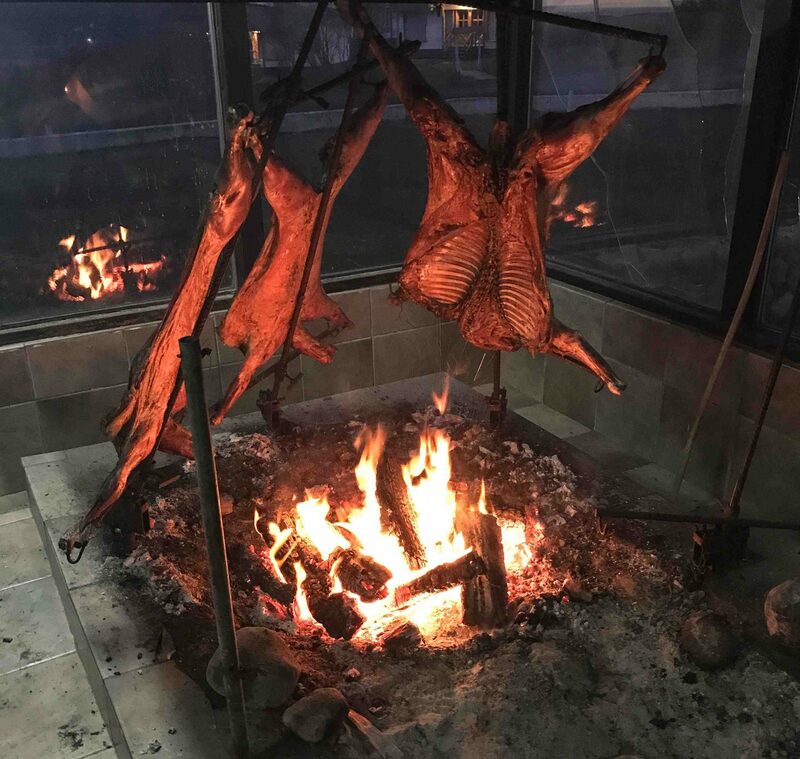 A Patagonian speciality, this would be our celebration dinner for the last night. While the salad table once again sat largely untouched, we devoured the lamb, gnawing every last morsel from the bone—all washed down with more wine, of course. As is custom in Argentina, the chef came out into the dining room to receive applause for her craftsmanship. We gave her a standing ovation—the food was that good—and watched as she shed a few tears of joy. There wasn’t a dry eye in the house after that. Amy is founder and editor of The GearCaster as well as a freelance outdoor and adventure travel writer. Her work regularly appears in award-winning publications such as Backpacker, Outside, and Adventure.Travel. A Minnesota native, she now calls San Francisco home, where she can be found most often outside on two wheels, hanging off of frozen waterfalls, or backpacking with her dog, Lola.